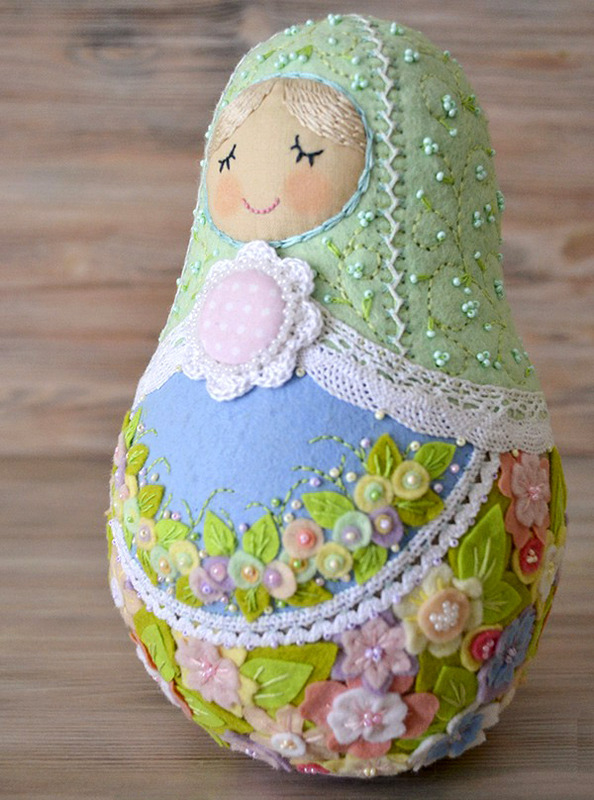 How to sew Matryoshka ~ DIY Tutorial Ideas! There are many fairy-tales in Russian folk tradition. And I thought, maybe they is one about matreshka? The tale is short in telling, but the deed is long in doing. 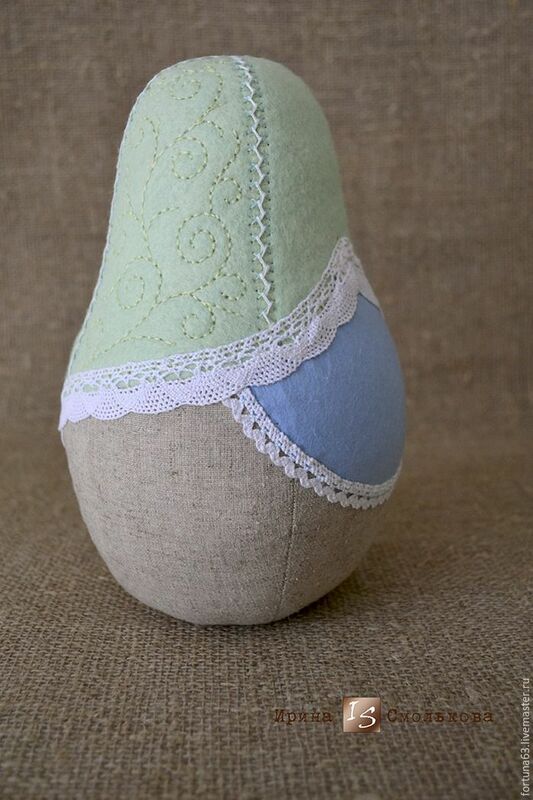 So, let's make a felt fairy-tale doll. Although I'm an experienced puppet-maker, but made such doll... for the first time. 1. Fabric for the base. 5. Beads of different colours. 9. 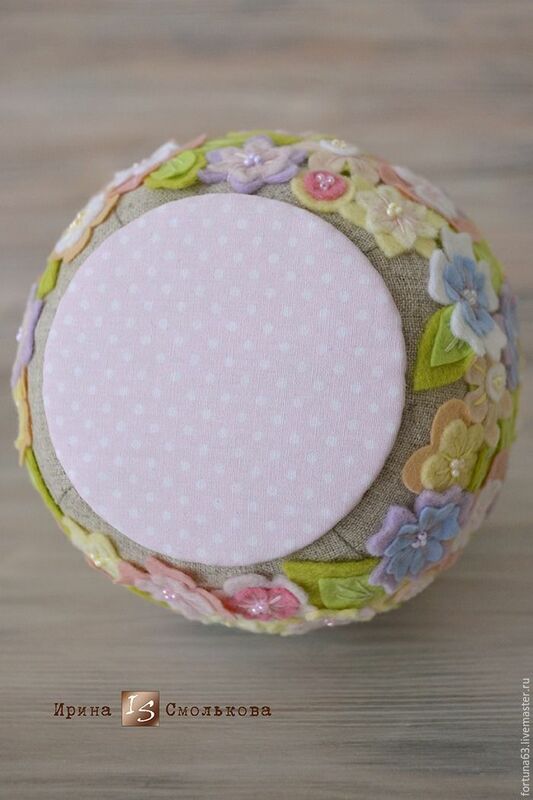 Needle for sewing and beading. And certainly a very large stock of patience. 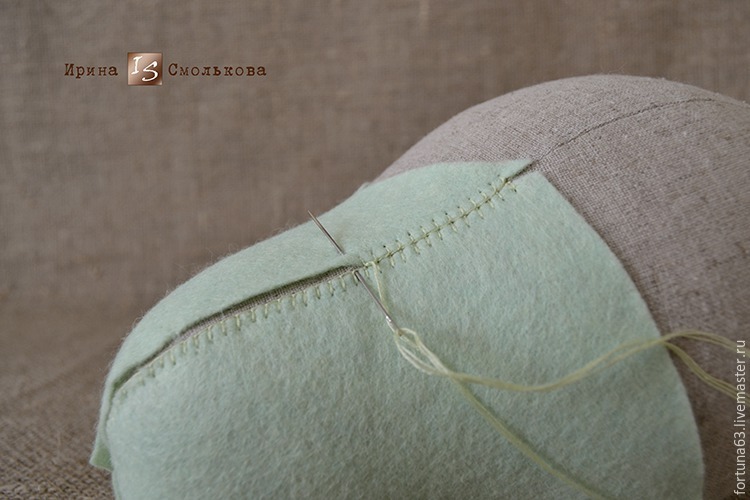 First you need to make the base from the following pattern. 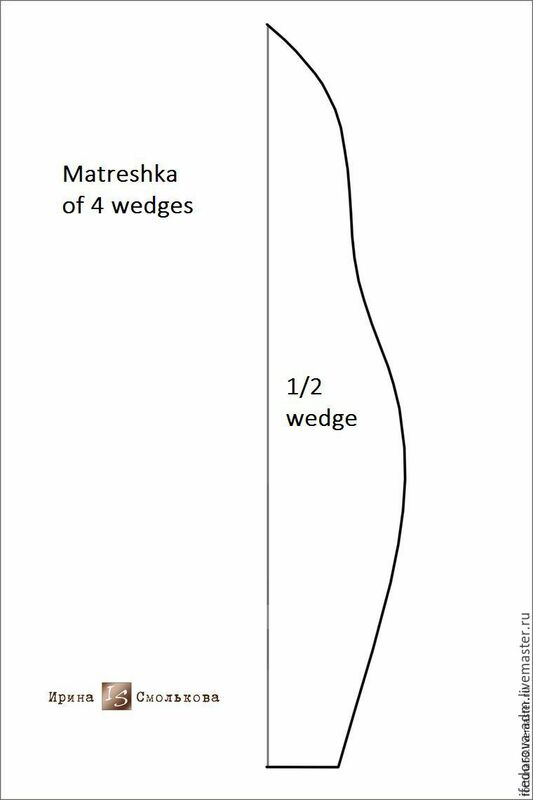 To do this, cut out four wedges, sew them together leaving the bottom open, turn outside in, stuff and pull the bottom with the thread. 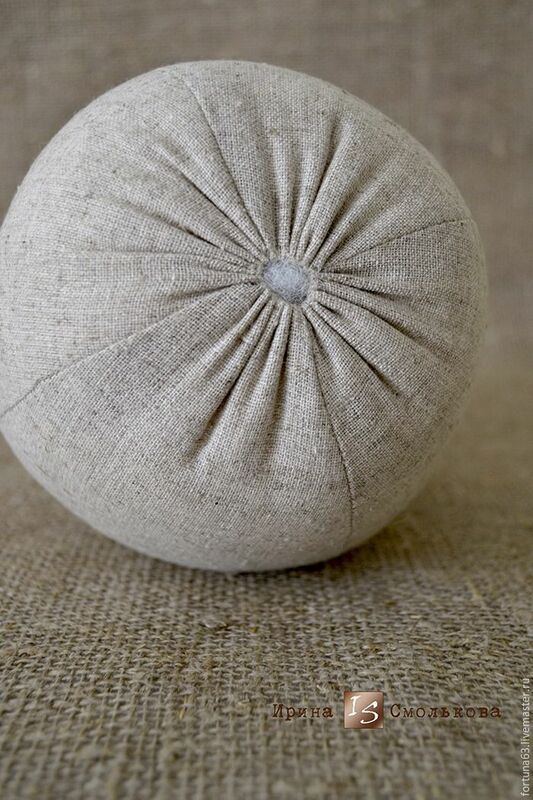 When the blank is ready, start the most long-lasting and laborious part of the work — preparing this base for decorating. 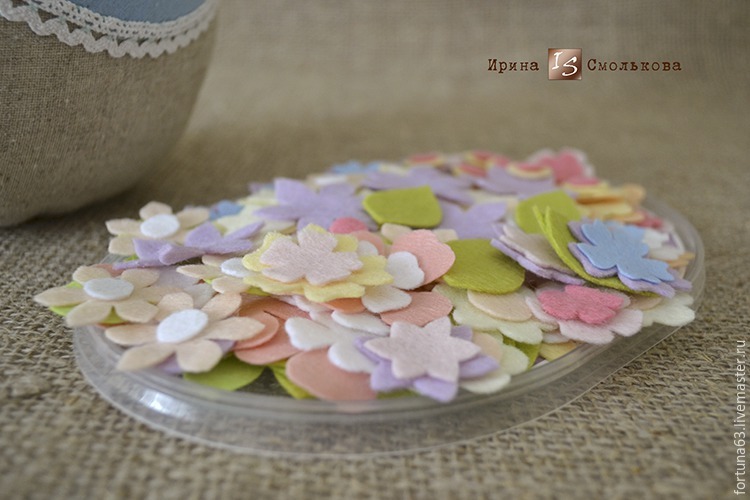 Take coloured felt. 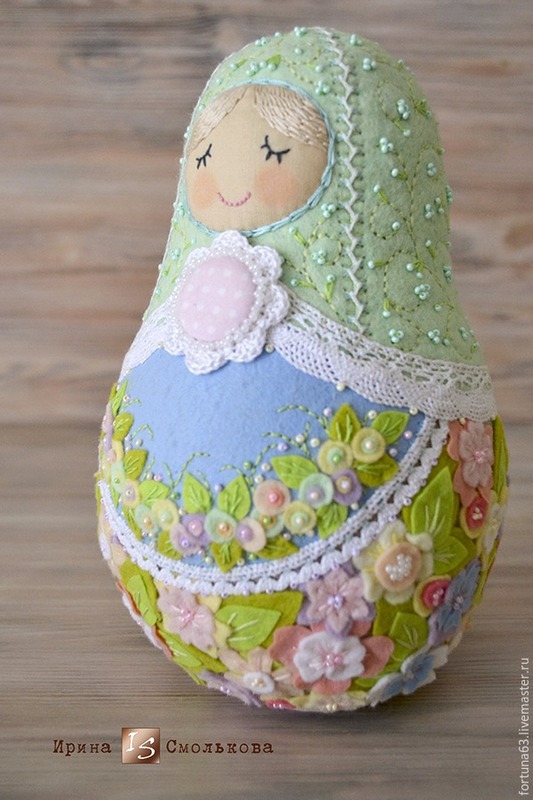 I chose light colours because the matreshka doll is tender and spring. 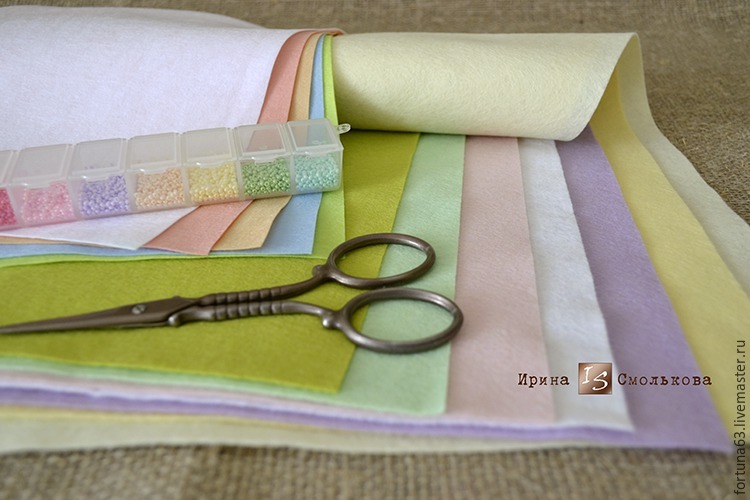 Now cut a handkerchief and apron. 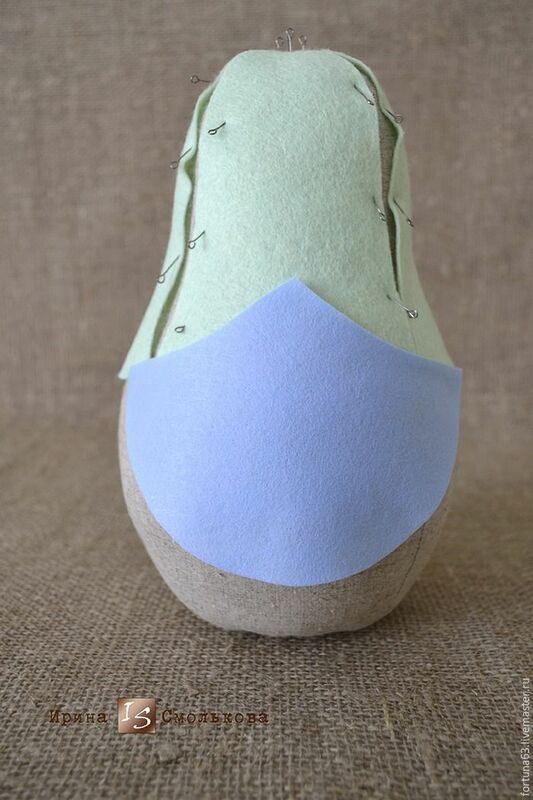 Pin felt and carefully cut it along the side seams of the blanks to design the bottom cut. Therefore, the handkerchief consists of four parts, and the apron of one. Now all four parts are sewn to the base. 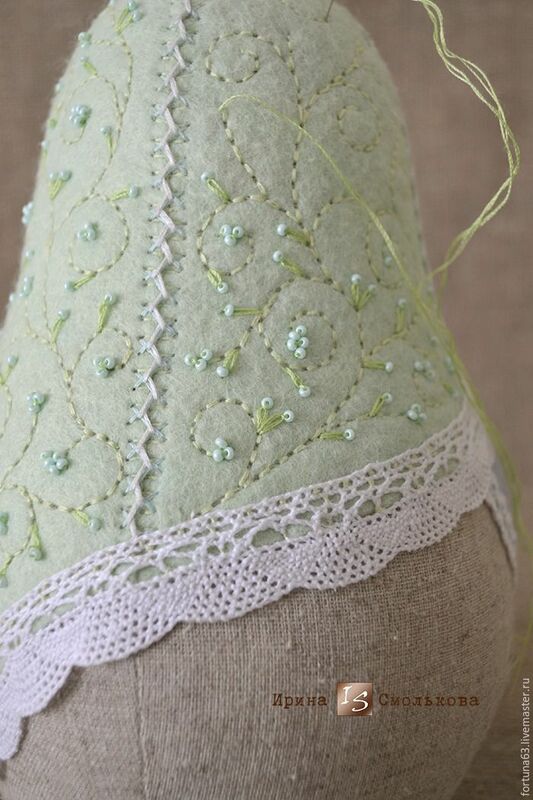 Next, I bedecked the seams with decorative stitches and embroidered the handkerchief. Sew the apron similarly. And the bottom of the scarf and apron are braided with lace. The first results of the labors are seen, but it is still far away from the final transformation. 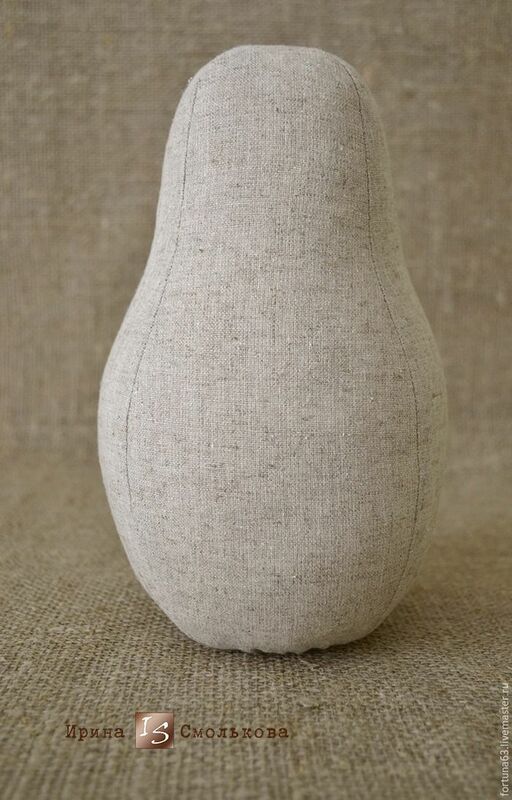 Meanwhile, our doll needs a face. 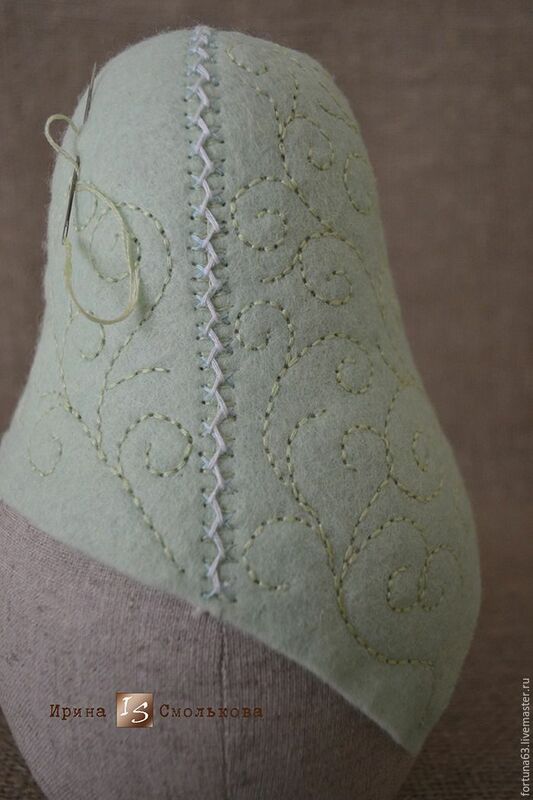 Cut it of flesh-coloured fabric and sew with a concealled seam. 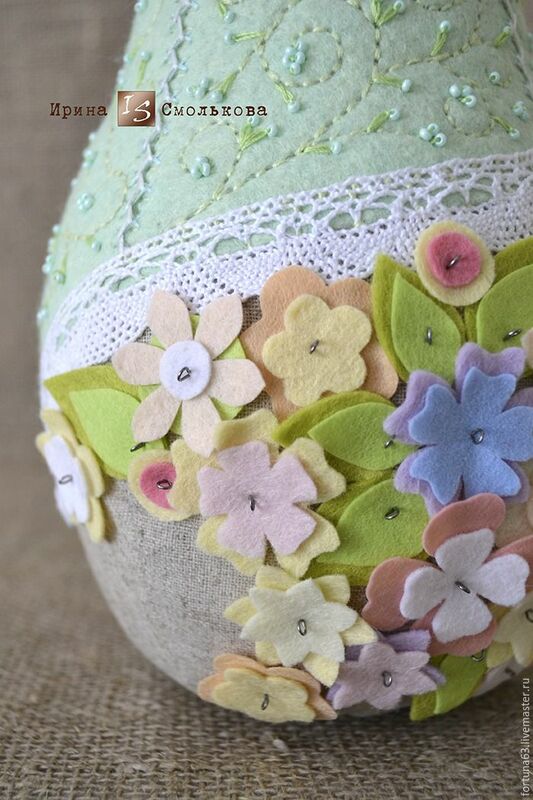 And now cut out lots of felt flowers and leaves of different size and colour for decoration. I cut with scissors and spent half a night on it :) You can find lots of useful templates in the Internet. 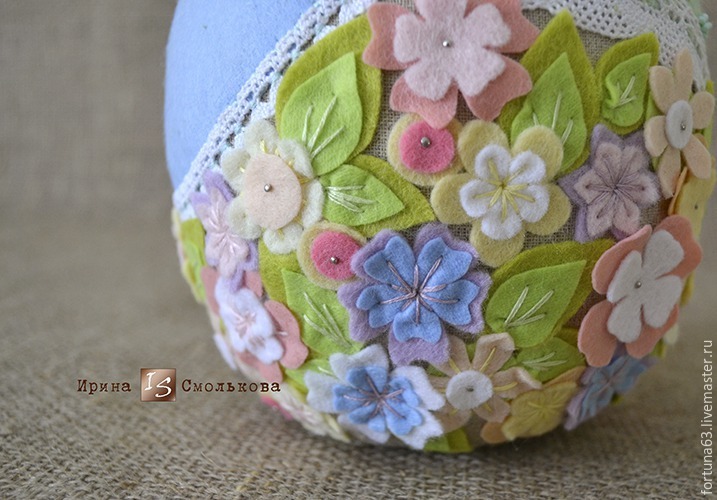 But before you strew the matreshka with flowers, spruce up her handkerchief. I added a few beads, and the handkerchief became even more beautiful. It's flowers time! 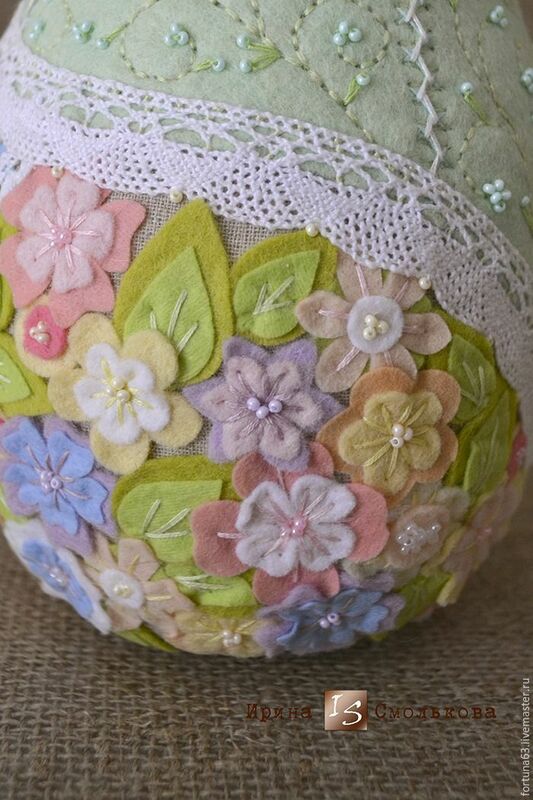 Pin them on free spaces to create a beautiful and harmonious floral pattern. 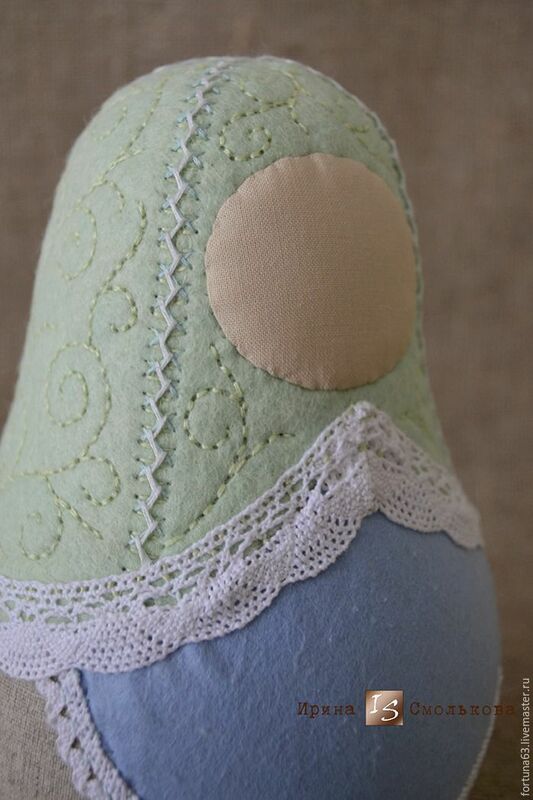 The doll is bloomig right before your eyes :) Now fix it using thread for embroidery of matching colours and beads. Then decorate the apron the same way. Very few is left. 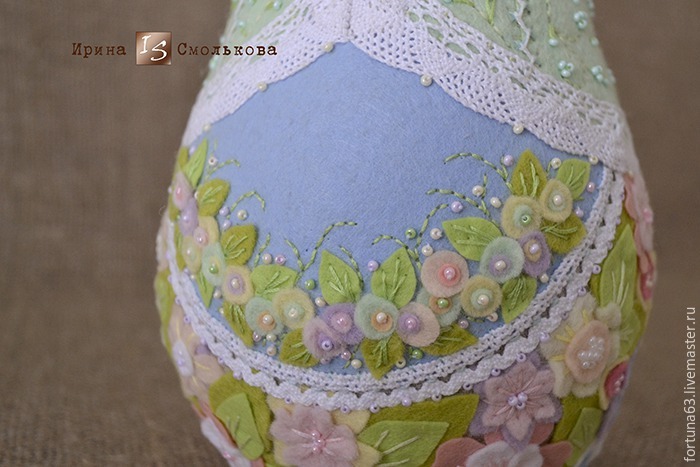 Draw the face, attach a decorative brooch. The last thing to do is to sew the bottom and all is ready! 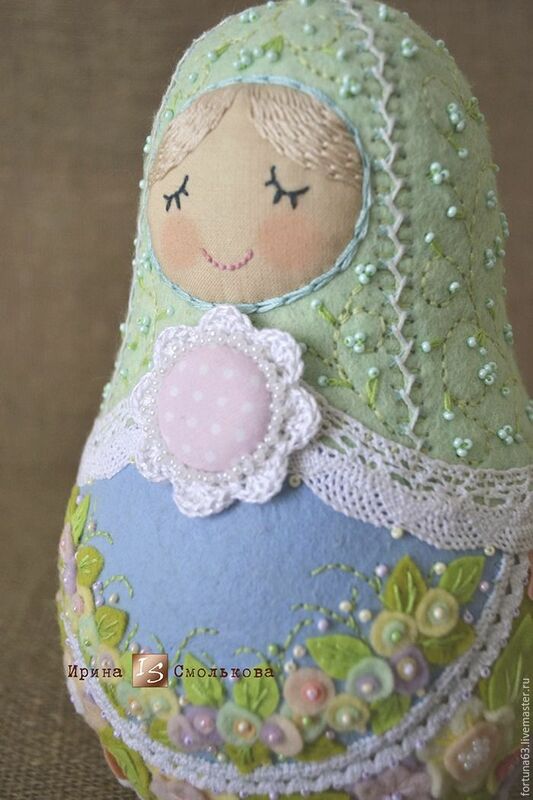 And here it is — a Russian beauty, her Majesty Doll in all its glory! Here the fairy tales ends :) Thank you for your attention! This is soooooo gorgeous!! Your work on her is stunning!! Wow! She is gorgeous! Your work on her is stunning! Love the tutorial, She is a beautiful doll!